Devil May Cry is one of CAPCOM’s most beloved series, and this “reboot” of the series brought about controversy and hatred you rarely see from fans, only proving how passionate they are about preserving fan favorites. However, CAPCOM and Ninja Theory are out to prove that change is good, even if you think you may not want it. Skeptical about this game initially, I became more and more interested the more I saw of it and fell in love once I played the demo (Which I have probably played over 50 times right now). Finally picking up the game upon release, I await with eagerness to see what they have in store for me. Triumph or Disappointment? 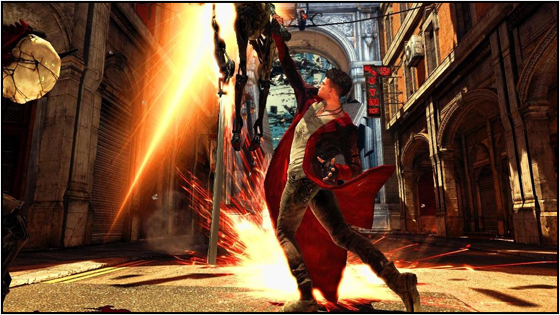 Catch the full review inside to see if DmC: Devil May Cry is a success or a failure! Click on any of the links below in order to jump directly to that particular section of the review. There is also a “Return to Content Area” link provided at the end of each particular section. 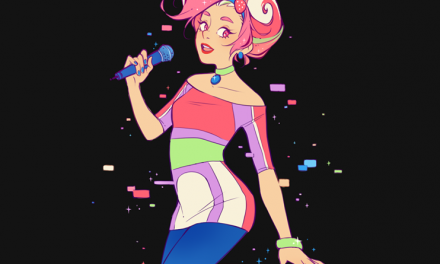 02. Menu & Modes Overview. 03. Campaign Synopsis & Impressions. 04. Enemy, Combat, & Weapon Impressions. 05. Future Downloadable Content (DLC). Upon leaving GameStop with DmC: Devil May Cry in my hands, I was anxiously awaiting the moment I got to slip the disc into my xbox 360 and truly see what this game was made of. Will it meet the high bar that previous installments set (Particularly Devil May Cry 3: Dante’s Awakening)? Or will it simply give fans something more to critique Ninja Theory on since most are already avoiding this game based on the look of our protagonist alone? I could not be sure until I got to experience it for myself. Opening the plastic for the game I was already disappointed, it did not have a game manual! I mean, it might have gone the way of Battlefield 3 and included it inside of the game itself, but this was already a huge red flag for me. Finally starting the game up I was waiting to see an opening sequence after all the company names that were involved were displayed (CAPCOM, Ninja Theory, etc), but to no avail. It quickly cut to the “Press Start” screen, just like it had in the demo and this was already bad news for me; what type of game, especially a stylish one, does not have some sort of cool opening before the start screen? After I graciously agree and push the start button, I am asked which slot I would like to save in, one of five. I choose the 2nd one and am immediately taken to the Main Menu which boasts a variety of options. However, I choose “New Game” and begin the campaign. Once you reach the Main Menu you will have a couple of options that are going to be immediately available to you: “New Game” (Or “Continue” if you are in the progress of beating the game, or nothing if you have beaten the game), Missions, Secret Missions, Training, Extras, Options, and Xbox Live Marketplace. Allow me to explain these modes more in detail so you will know what each of them are meant for. New Game/Continue – This is basically the Campaign mode of the game. 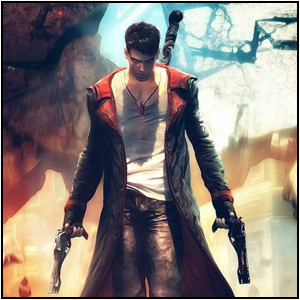 Here you will progress through the universe of DmC: Devil May Cry and watch the story unfold of our protagonist, Dante. You will be given “New Game” if it is your first time going through the story and “Continue” if you have started the campaign but have not finished it as of yet. Also, if you have already completed the game this option will no longer be selectable. When beginning a new game you have the choice of three difficulty settings: Human, Devil Hunter, and Nephilim. Unlockable difficulties include Son of Sparda, Dante Must Die!, Heaven or Hell, and Hell or Hell modes. Missions – This mode allows you to go back and replay a mission you have already completed, however you are only able to select missions if you have beaten it on a equal or greater difficulty (If you have completed the game on Nephilim then you do not have to beat it on Devil Hunter or Human to select it at that difficulty, however, you will only be able to pick the first mission in Son of Sparda mode). It will also tell you the number of Keys you have in your possession, as well how many Keys, Secret Doors, and Lost Souls you have for that particular mission; very useful if you are trying to go for a 100% completion on every stage. Secret Missions – This mode allows you to replay the Secret Missions you have unlocked by accessing the doors which require Keys. Training – This mode lets you fight against a lone enemy whom is indestructible and does not fight back. You are able to switch between weapons freely within an infinite space in order to practice your combos (They are also displayed in the upper right-hand corner of the screen). This mode reminds me of the little practice area in Bayonetta while you were waiting for the next area to load. Extras – This mode features various other options that can be accessed: Leaderboards, Stats, Achievements, Concept Art, Replay Intro Sequence, Credits, and Enter Prize Code. Leaderboards is your basic worldwide rank for how well you did in a difficulty on a particular mission, even ranks those who are on your friend’s list against you. Stats tell you basic things about how long you have played the game, your total time played in every difficulty, and time played in either Angel or Demon mode. Achievements is just a list of the achievements that are present in the game. Concept Art is a gallery which unlocks art dependent on things that are accomplished in game, such as clearing a mission on a particular mode, killing a certain number of a particular enemy, and total number of strikes with a particular weapon. Replay Intro Sequence is just a replay of the very first CG cutscene from when you start a new game. Credits is just the ending roll that tells who all worked on DmC: Devil May Cry. Enter Prize Code has no details given on it, but it may be something akin to what GearBox did with Borderlands 2 SHiFT codes. The campaign is focused around Dante, someone who is accustomed to a life of partying and fornication without much care for anyone other than himself, and that is made very clear upon the opening cinematic. Coming into contact with Kat, a medium who helps him out against the Hunter demon while he is in limbo, convinces Dante to join an organization known as “The Order” which is lead by his twin brother, Vergil. Soon finding out his origin and realizing that he and his brother are Nephilim, the spawn of an Angel Mother and Demon Father, are the only ones capable of stopping Mundus from corrupting the world. These three set out on a quest to save humanity from the clutches of the evil Demon King. This story starts off quite beautifully. 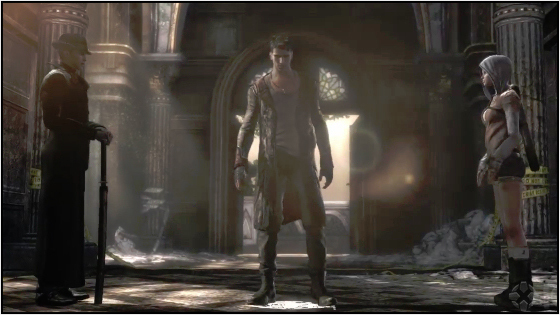 You are anxious and pumped up from the second you are able to control Dante simply because of the backdrop they have set for the story by the opening cut scene. In my opinion, it is the most well thought out opening for any Devil May Cry game simply because you know exactly what is going on. The opening level features a very good way of introducing all the gameplay elements and allowing you to test them out as they come, they do this better than any previous installment of Devil May Cry as well. However, I feel like as good as they had of an opening and various mood setters throughout the duration of the story, they could have had a more meaningful ending that gave way to greater emotion and was not so telegraphed. I feel as though I was let down and they did their best to combine the original Devil May Cry and Devil May Cry 3: Dante’s Awakening in how they setup everything. I feel this is a time where I can really relate to the Mass Effect 3 fans about how everything was perfect up until the ending where it makes everything else feel for naught. The environments really help you understand what limbo is and the function that it serves. The contorting of the terrain and the feeling that the world itself wants Dante dead only conveys the power that Mundus has and the type of demon hordes that bend to his will. All-in-all I feel like they did a very good job telling you exactly what limbo is and how it effects the real world, even though normal humans are unable to see what is happening that is causing the anomalies in their own reality Cool visual effects take place because of this as well, you are constantly having to navigate by use of the Angel Lift and Demon Pull, often times in rapid succession where if you do not think quickly enough you could die. This makes for an interesting way to navigate the environment as it is much deeper than what Nero did with his Devil Bringer in Devil May Cry 4. However, at times you are doing entirely too much of this when you should be fighting, it feels like some parts are intentional fillers and make no real headway to stay into the action. The characters within the story are pretty engaging, however they do fall short on a few key characters. Dante’s personality seems to stay true to the cocky nature he showed throughout Devil May Cry 3: Dante’s Awakening and Devil May Cry 4. Saying things like, “Which one of you fat-asses want to go on the Biggest Loser?” when fighting against a set of Tyrants. He is pretty stylish in the very beginning of the game when he is putting on his clothes and grabbing the weapons, however he does not remain this way throughout the rest of the story; sure, he has some pretty cool cinematic scenes which show the raw depth and emotion, but nothing cool and exciting when he obtains each weapon (No awesome display of mastery over the weapon with an exhibition of it like in Devil May Cry 3: Dante’s Awakening). I believe they did stay true to his character and even without the white hair he is still Dante; only thing they did not do correctly is make him seem “More than human” as far as damage he is able to sustain. Vergil seems very much unlike himself. Vergil within the previous installment was more of a loner preferring to rule under his own power without the aid of anyone else. Even beyond this was the fact he seemed mostly like a weakling throughout the entire game, allowing Dante to the vast majority of the work and never seeming to be a key element besides being a recruiter; he was a complete letdown in this iteration. Kat is a very interesting character but not enough of her back story is given for me to draw a huge conclusion about exactly who she is in her entirety. She appears to be Dante’s love interest but then again it seems as though he only cares for her as a friend, likewise with her seemingly being in love with Vergil. Mundus is a complete let down of a Demon King. Throughout the entire game you never really feel like he’s the big boss in charge, you feel more so like he is incapable of doing his own work, even when you end up confronting him. They should have did a better job of making him more frightening as far as his power goes…which leads to another issue I wish to speak about. As far as the back story of Dante and Vergil, I am quite upset about how weak they made Sparda out to be. Within the previous games he was known as “The Dark Knight Sparda”, a demonic entity that fought back the hordes of hell single-handedly and sealed himself and them away in order to protect humanity from its certain annihilation. here, it sounds like someone who had a change of heart upon meeting an Angel and who was afraid of the wrath of Mundus, seems like he was little more than a coward when it came down to it and was not even able to protect his boys, their mother, Eva, did that. I feel like Dante and Vergil should not have been able to beat Mundus if he was really that powerful, especially with them not coming from a powerful lineage, especially if the Nephilim race was completely wiped out by Mundus already. I believe, besides the fact that they are Nephilim, they should not have had the power to defeat someone who is supposedly as strong as Mundus. Now, as far as beating the game and the difficulties they set it on. I find that the three starting difficulties of Human, Devil Hunter, and Nephilim, are the equivalent to Very Easy, Easy, and Normal Modes. I find in order to get the full experience everyone should begin the game on Nephilim mode and only convert to Devil Hunter or Human if you find that to be entirely too hard for you to deal with (And for some people it may be for later levels). However, the fact that you feel so satisfied after beating the game and have a chance to unlock additional costumes would only make you want to go back and finish it on higher difficulties just for that. Personally, I think they should have started everyone off with Devil Hunter, Nephilim, and Son of Sparda difficulty. Despite what I believe to be a very weak ending and lackluster boss fights as far as those were concerned, I feel like DmC: Devil May Cry offered a really solid experience. It has a superior story when compared to any of the others by far and it retained the humor from the older games (Particularly liked the part in the first mission when he rejected the thought of looking like old Dante when a mop fell on his head and he had hair similar to the previous iteration of our hero) as well as the feeling of “Dante”. While Ninja Theory would have had a certified classic on their hands if they were able to end it properly, they still have a solid title that does the Devil May Cry series justice. Excellent work. Combat in this game seems to be the very best in the series. It seems to combine a lot of good elements from previous games with a weapon swapping system that could seem complicated at first, but is actually rather simplistic and enjoyable. While Ninja Theory takes the “Hold to switch modes” approach they had in Heavenly Sword, it actually works surprisingly well in DmC: Devil May Cry. Holding down Left Trigger grants you access to Angelic weaponry, while holding down Right Trigger grants you access to Demonic Weaponry. Once you have multiple weapons and guns, you can push left on the D-Pad to cycle between Angel weapons, right on the D-Pad to cycle between Demonic weapons, and Up on the D-Pad to cycle between your available guns. This makes things a lot more interesting since you will have access to 8 weapons you can use at any given time by the time the game is over. You are able to juggle enemies for an infinite amount of time as long as you utilize your abilities in order to stay in the air, as well as receive your usual rankings for style (From D to SSS): Dirty!, Cruel!, Brutal!, Anarchic!, Savage!, SSadistic! !, SSSensational!!! Enemies in this game are actually the best I have come across since Devil May Cry 3: Dante’s Awakening. I say this because I prefer to fight against opponents who offer a legitimate threat without being overly cheap or annoying, while you do have annoying opponents, I would not say that any of them are particularly cheap since everyone has an exploitable strategy to counter. While you do not have too many enemy types, they vary enough to give you a good mix of opponents who each require a different optimized strategy in order to combat. You basically have grounded enemies, air enemies, enemies who have a type of “Super Armor”, enemies who require a particular weapon type (Angel or Demon) in order to kill them, and what I like to call “Special” enemies. Grounded enemies like Stygian and Death Knights can be defeated with any weapon and are prone to attacking you specifically on the ground. Air type enemies like Harpy and Pathos have the ability to fly and will attack you from the air, forcing you to either go to them or bring them down to you. Super Armor enemies like Tyrant and Butcher are immune to being stunned by weapons when enraged or unable to be effected except for a specific weak point. Enemies like Frost Knight and Hell Knight can only be hurt by either an Angelic or Demonic weapon specifically, as any other type of weapon will be nullified, causing Dante to stagger for a moment. Special enemies are people like Ghost Rage and the Witch, which has specific properties that effect them (Ghost Rage cannot be hurt while intangible except for Angel weapons and the Witch is able to erect a shield around herself and other enemies). As far as fighting enemies goes, you have different strategies that are pointed out in order to deal with each of them, for instance: When fighting a Witch it is probably a good idea to use Aquila’s “Round Trip” maneuver in order to quickly destroy her shield. When fighting against a Tyrant, using the Kablooey’s darts can quickly get him out of Rage mode in order to Demonic Pull him and score some easy damage. Not to mention when fighting against Demonic Shards it is better to use the Shotgun so you are not busy trying to mash with Ebony & Ivory. I find that you have to use every single weapon in your arsenal in order to defeat the enemies and knowing when to use what is the key, this makes them particularly fun. Now, something I really did not like was the bosses within the game.. they were too.. easy. Basically, they had a very controlled pattern that was not at all hard to figure out. Within previous games the bosses also had patterns but were a lot more unpredictable in the exact moments they would do it or had an attack that was especially hard to avoid if you were at a particular spot on the stage that another one of their attacks forced you to move to. Here, they just seemed like they were created because there needed to be boss-like characters present. Next time around Ninja Theory should take time to develop more patterns for bosses as well as independent actions they can take that are random in occurrence. As far as the Devil Arms, or weapons in this game, I have to say I am impressed with everyone of them. 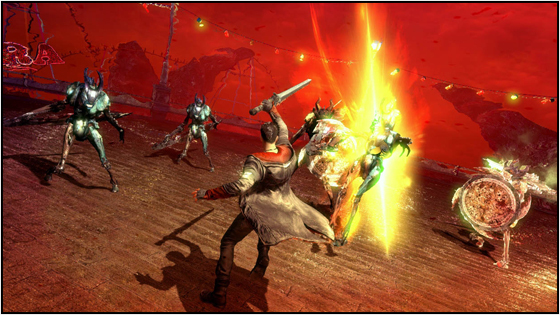 Each weapon has its own unique abilities to compliment Dante and each serve a particular purpose level-wise and enemy wise. Unlike previous games where you may find yourself able to do without any particular weapon and clear the game with your favorites only, you will find yourself in need of upgrading every single on in order to make the experience less brutal. You may think that getting a new weapon would render your older one useless or archaic, but you quickly find out that it is something to be used in addition to, not in replacement of. I find that every weapon makes the combat better and better, the combos you are able to chain together are immense and overall I think they did a good job; the only thing I wish was done better was the actual look of the weapons and how they are presented when you first obtain them. As far as the enemies, weapons, and combat goes, Ninja Theory got this spot on. Fights can be frustrating and annoying at times, but when you are in the groove you are in there. I cannot wait to try my luck on higher difficulties to see what “remixed enemy waves” has in store for me. Planned already to release are two particular DLC’s: Vergil’s Downfall (Seen in the trailer above) and Bloody Palace. However, I also suspect we will be seeing more weapon skins as well as costumes for Dante to use. Vergil’s Downfall is based on what Vergil had to go through after the end of the game (Kind of a spoiler in my opinion). It is a separate story altogether and allows you to use Vergil’s style, brand new weapons, and you also fight brand new enemies. This will be available shortly after launch free of charge for those who pre-ordered the game. I badly want to play this mode in hopes that something about it will redeem Vergil in my eyes. I never liked him back when he was first introduced in Devil May Cry 3, but I like this version of him even less because I cannot even respect him because I think he is a weakling. Bloody Palace mode is 100 levels of enemies that are progressively harder than the last. If you played Devil May Cry 3: Special Edition or Devil May Cry 4, you will not be a stranger to this mode (And if you played Bayonetta, it is similar to Lost Chapter: Angel Slayer). I am especially looking forward to this mode because I love the combat in this game even more than the story, and since I have never taken it upon myself to beat a Bloody Palace, this is going to be a good place to start. 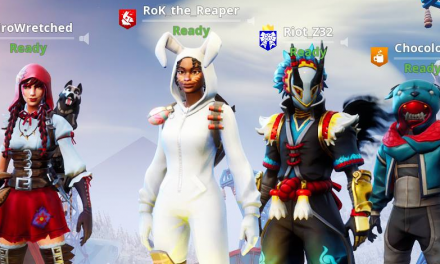 As far as weapon skins and costumes, I read that they will be available on Xbox Live and Playstation Network sometime in the future. So, I am guessing you can unlock certain costumes by beating the harder difficulties of the game, but there might also be costumes you can only unlock by purchasing them. Only time will tell. Ninja Theory, in the face of all adversity and hate from the general populace that make up the Devil May Cry fan base, managed to make a good game that does the original proud. While it is not the best it could have been and there are hints of wasted potential, it does not disgrace the foundation upon which CAPCOM created the series and allows us fans to know that this franchise is in good hands. The characters are engaging, the combat is deep and well thought out, and the environments and worlds make a complete impact on you, more than scenes in other Devil May Crys have by far. I honestly feel that everyone who likes this game will enjoy it and the effort and love placed into it. From the expressions the characters make to the feeling of accomplishment once you SSS your fist mission, it is completely indescribable. Those people who are still up-in-arms about Dante’s new look need not be so quick to judge a book by its over, for the appearance does not make the game and this proves that if anything has ever did. 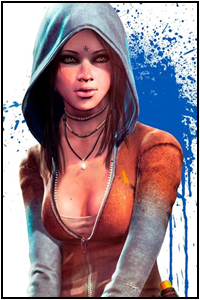 Well done Ninja Theory. This has been my review for DmC: Devil May Cry. Arigatou & Sayonara! 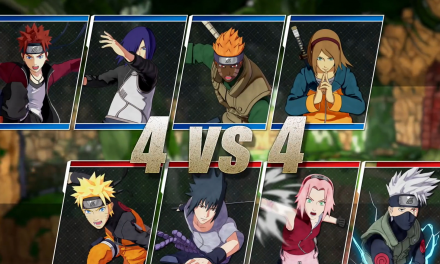 Naruto to Boruto: Shinobi Striker — Release Date Revealed + New Trailer! Frickin spot on review man. Very detailed and you can feel your enthusiasm. Are you a professional game reviewer BTW? Nope, unfortunately I am not. However, I do write a lot and I have a real passion for gaming.